Oko Polytechnic in Anambra State may be having a new name soon, if the executive decides to immortalise a former Vice President, Dr. Alex Ekwueme, who died on Sunday. The Nigerian Senate has asked the executive arm of government to 'immediately name the Federal Polytechnic Oko and other Federal assets' after a former Vice President, Dr. Alex Ekwueme, who died on Sunday. 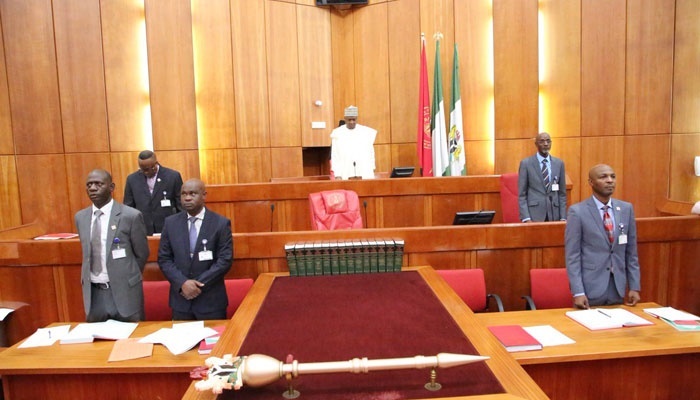 It was a decision reached at plenary on Tuesday after the Deputy Senate President, Ike Ekweremadu, raised a point of order on the death of the former Vice President. He told the Senate that Dr. Ekwueme was an intellectual giant that lived an exemplary life worthy of emulation. After Ekweremadu's comments, other Senators also contributed, all of them eulogising the former Vice President who died in a London hospital. "Ekwueme's lifestyle shows that Nigeria is not lacking in men that we can count on. "In 1999 he ran under PDP. On losing the primary election, he did not threaten to tear PDP apart or say there is no democracy," Senator Enyinnaya Abaribe said. Another lawmaker, Senator Bala Ibn Na’Allah said he saw the late leader three weeks ago at Abuja airport. "Three weeks ago, I and my colleagues met Alex Ekwueme at the international airport on his way to Enugu and waited for almost 2 hours to board his flight. "Alex can be described as a single Nigerian despite being from an Igbo extraction" Senator Na’Allah stated. "Ekwueme stands out to be a unique public figure and adjudged to be incorruptible, he left Government poorer." Senator James Manager contributed. Making his remarks before final decision was put forward, the Senate President, Dr. Bukola Saraki, said: "It is a great loss for the Country. "Alex Ekwueme was a detribalised Nigerian that puts Nigeria 1st and showed loyalty to the former Government headed by Shehu Shagari. After his comments, the Senate observed a minute silence and reached an agreement to send a delegate of the Senate to condole with the family, government and people of Anambra State. It then called on the executive to immediately name the Federal Polytechnic Oko and other Federal assets after him.